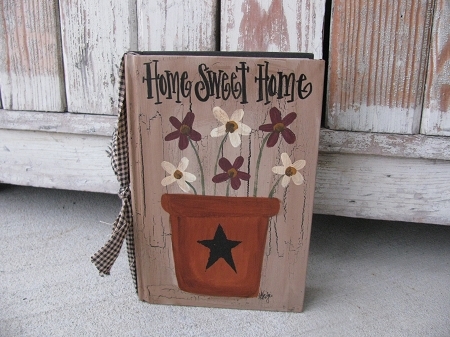 Primitive Flower Pot and Flowers Hand Painted Vintage Book. Perfect book for the whole spring/summer season! I love painting on old vintage hard covered books. Gives them a whole new lease on life. I've painted this one with my flower pot design filled with burgundy and cream colored flowers. You can customize your saying on your book. The options are listed. Sizes are around 8"x5.5" because I recycle old books, book sizes will vary slightly. Hand painted, designed and signed by Heidi.